Genie's one-woman operation eventually grew into a full-fledged research laboratory with twenty-five diverse research programs, a formal education division and the public Mote Aquarium. She was a research assistant at Scripps Institution of Oceanography, at the New York Zoological Society, and at the American Museum of Natural History in New York. Dr. Clark was the recipient of three honorary D.Sc. degrees and awards from the National Geographic Society, the Explorers Club, the Underwater Society of America, the American Littoral Society, the Gold Medal Award of the Society of Women Geographers, and the President's Medal of the University of Maryland. She has authored three books and over 160 scientific and popular articles. 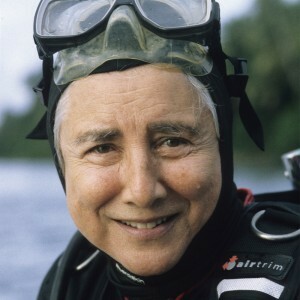 She conducted 72 deep submersible dives. Her last research projects concerned the behavior of tropical sand fishes and deep sea sharks. These studies have been featured in 12 articles she has written for National Geographic magazine. Clark, E. 1941. Letter to the editor. Natural History 50:311-312. Breder, C.M. & E. Clark. 1947. A contribution to the visceral anatomy, development, and relationships of the plectognathi. Bull. Amer. Mus. Nat. Hist. 88: 287-319 + 4 pl. Clark, E. 1947. Notes on the inflating power of the swell shark, Cephaloscyllium uter. Copeia 1947: 278-280. Clark, E. 1949. Notes on some Hawaiian plectognath fishes, including a key to the species. Amer. Mus. Novitates 1397: 1-22. Clark, E. & J.M. Moulton. 1949. Embryological notes in Menidia. Copeia 1949: 152-154. Sperry, R.W. & E. Clark. 1949. Interocular transfer of visual discrimination habits in a teleost fish. Physiol. Zool. 22: 372-378. Clark, E. 1950. Notes on the behavior and morphology of some West Indian plectognath fishes. Zoologica 35: 159-168. Clark, E. 1950. A method for artificial insemination in viviparous fishes. Science 112 (2920): 722-723. Clark, E. 1950. Fisherman beware! Fishing for poisonous plectognaths in the western Carolines. ONR Research Reviews, Washington, D.C. 6 pp. Clark, E. & L.R. Aronson. 1951. Sexual behavior in the guppy, Lebistes reticulatus (Peters). Zoologica 36: 49-66 + 7 pl. Clark, E. & R.P. Kamrin. 1951. The role of the pelvic fins in the copulatory act of certain poeciliid fishes. Amer. Mus. Nov. 1509: 1-14. Clark, E. 1951. Field trip to the south seas. Natural History 60: 8-15. Clark, E. 1951. Wonders of the deep. Cairo Calling 847 (2): 12-13. Aronson, L.R. & E. Clark. 1952. Evidences of ambidexterity and laterality in the sexual behavior of certain poeciliid fishes. Amer. Natur. 86: 161-171. Clark, E. 1952. Spearfishing in the Red Sea. The Skin Diver 1(6): 2-3. Clark, E. 1952. Book review of 'Diving to adventure' by H. Haas. Natural History 61:5. Clark, E. 1952. The lost quarry. Natural History 61: 258-263. Clark, E. 1952. A scientific journey to the Red Sea, Part 1. Natural History 61: 344-349. Clark, E. 1952. A scientific journey to the Red Sea, Part 2. Natural History 61: 414-419. Clark, E. & H.A.F. Gohar. 1953. The fishes of the Red Sea: order Plectognathi. Cairo University Press, Publ. Mar. Biol. Sta. Al Ghardaqa (Red Sea) 8. 80 pp. + 4 pl. Clark, E. 1953. Book review of 'The silent world' by J.-Y. Cousteau & F. Dumas. Natural History 62: 149. Clark, E. 1953. Lady with a spear. Harper & Brothers Publishers, New York. 243 pp. (a Book-of-the-Month Club selection; translated into seven languages, over 23 foreign editions, braille and records for the blind -- see separate list). Clark, E. 1953. Siakong, spear-fisherman pre-eminent. Natural History 62: 227-234. Clark, E., L.R. Aronson & M. Gordon. 1954. Mating behavior patterns in two sympatric species of xiphophorin fishes: their inheritance and significance in sexual isolation. Bull. Amer. Mus. Nat. Hist. 103: 135-225. Clark, E. 1955. From 'Lady with a spear'. Compact, The Young People's Digest 4(5): 120-130. Clark, E. 1956. Beneath the brine. Book review of 'Man under the sea' by J. Dugan. The Saturday Review (New York) 39: 17-19. Woodburn, K.D., B. Eldred, E. Clark, R.F. Hutton & R.M. Ingle. 1957. The live bait shrimp industry on the west coast of Florida (Cedar Key to Naples). Fl. State Board Consv., St. Petersburg Tech. Ser. 21. 33 pp. Heller, J.H., M.S. Heller, S. Springer & E. Clark. 1957. Squalene content of various shark livers. Nature 179: 919-920. Clark, E. 1958. Jellied condition in Paralichthys squamilentus from the Gulf of Mexico. Quart. J. Fl. Acad. Sci. 21: 187-189. Clark, E. 1959. Functional hermaphroditism and self-fertilization in a serranid fish. Science 129 (3343): 215-216. Clark, E. 1959. Instrumental conditioning in lemon sharks. Science 130 (3369): 217-218. Clark, E. 1960. Four shark attacks on the west coast of Florida, Summer 1958. Copeia 1960: 63-67. Royal, W. & E. Clark. 1960. Natural preservation of human brain, Warm Mineral Springs, Florida. Amer. Antiquity 26: 285-287. Clark, E. 1961. Current Research at Cape Haze Marine Laboratory, and reports for 1955-1961. Brochure, Mote Marine Laboratory. 16 pp. Clark, E. 1962. An ichthyolost at Eilat. Skin Diver Magazine 11: 22-23, 51. Saunders, G.B. & E. Clark. 1962. Yellow-billed cuckoo in stomach of tiger shark. The Auk 79: 118. Clark, E. 1962. Maintenance of sharks in captivity. Part 1. General. Bull. Inst. Oceanogr. Monaco, Special No. 1A: 7-13. Clark, E. 1962. Expedition returns from Red Sea. Copeia 1962: 678. Clark, E. 1963. Massive aggregations of large rays and sharks in and near Sarasota, Florida. Zoologica 48: 61-66 + 2 pl. Clark, E. 1963. Cape Haze Marine Laboratory. Amer. Zool. 3: 1-3. Moore, J.C. & E. Clark. 1963. Discovery of right whales in the Gulf of Mexico. Science 141(3577): 269. Clark, E. 1963. The maintenance of sharks in captivity, with a report on their instrumental conditioning. pp. 115-149. In: P.W. Gilbert (ed.) Sharks and Survival, Heath and Co., Boston. Davies, D.H., E. Clark, A.L. Tester & P.W. Gilbert. 1963. Facilities for the experimental investigation of sharks. pp. 151-162. In: P.W. Gilbert (ed.) Sharks and Survival, Heath and Co., Boston. Clark, E. 1963. The maintenance of sharks in captivity. Part. 2. Experimental work on shark behavior. Bull. Inst. Oceanogr. Monaco, Special No. 1D: 1-10. Clark, E. 1964. Spinal defomity noted in bull shark. Underwater Naturalist 2: 26-28. Clark, E. 1965. Recent studies of sharks. pp. 243-245. In: N.P. Wright (ed.) Fifth Annual Convention, Underwater Society of America, Mexico City. Clark, E. & K. von Schmidt. 1965. Sharks of the central Gulf coast of Florida. Bull. Mar. Sci. 15: 13-83. Clark, E. 1965. Parasitic stone crab? Sea Frontiers 74: 52-53. Clark, E. 1965. Mating of groupers. New studies detect reversal of stripes in hermaphrodotic fish. Natural History 74(6): 22-25. Clark, E. 1965. Massed sharks and rays off Florida. Animals 6(20): 572. Clark, E. 1966. Pipefishes of the genus Siokunichthys Herald in the Red Sea with description of a new species. Sea Fish. Res. Sta. Haifa Bull. 41: 3-6. Clark, E. & K. von Schmidt. 1966. A new species of Trichonotus (Pisces, Trichonotidae) from the Red Sea. Sea Fish. Res. Sta. Haifa Bull. 42: 29-36. Aronson, L.R., F.R. Aronson & E. Clark. 1967. Instrumental conditioning and light-dark discrimination in young nurse sharks. Bull. Mar. Sci. 17: 249-256. Clark, E. 1967. The need for conservation in the sea. Oryx 9: 151-153. Clark, E. 1968. Eleotrid gobies collected during the Israel South Red Sea Expedition (1962), with a key to Red Sea species. Sea Fish. Res. Sta. Haifa Bull. 49: 3-7. Clark, E., A. Ben-Tuvia & H. Steinitz. 1968. Observations on a coastal fish community, Dahlak Archipelago, Red Sea. Sea Fish. Res. Sta. Haifa Bull. 49: 15-31. Clark, E. 1969. The lady and the sharks. Harper & Row Publishers, New York. 269 pp. (1972 Japanese edition entitled 'Sea, sun and sharks', and 1990 paperback edition by Mote Marine Laboratory, Sarasota). Clark, E. 1971. Observations on a garden eel colony at Elat. Hebrew University of Jerusalem Marine Biological Laboratory Scientific Newsletter 1: 5. Clark, E. 1971. The Red Sea garden eel. Underwater Naturalist 7: 4-10. Clark, E. 1971. Useful animals. Book review of 'The life of sharks' by P. Budker (English edition). Science 174: 136. Clark, E. 1971. In memoriam: Heinz Steinitz. Sea Fish. Res. Sta. Haifa Bull. 58: 2-4. Clark, E. & S. Chao. 1972. A toxic secretion from the Red Sea flatfish, Pardachirus marmoratus (Lacepede). Hebrew University of Jerusalem, The Heinz Steinitz Marine Biological Laboratory Scientific Newsletter 2: 14. Clark, E. 1972. The Red Sea's gardens of eels. Nat. Geographic 142: 724-735. Clark, E. & W. Aron. 1972. Heinz Steinitz: to realize a dream. Israel J. Zool. 21: 131-134. Clark, E. 1973. "Sleeping" sharks in Mexico. Underwater Naturalist, Bull. Amer. Littoral Soc. 8: 4-7. Clark, E. & S. Chao. 1973. A toxic secretion from the Red Sea flatfish Pardachirus marmoratus (Lacepede). Sea Fish. Res. Sta. Haifa Bull. 60: 53-56. Clark, E. & A. Ben-Tuvia. 1973. Red Sea fishes of the family Branchiostegidae with a description of a new genus and species Asymmetrurus oreni. Sea Fish. Res. Sta. Haifa Bull. 60: 63-74. Clark, E. 1974. The Red Sea's sharkproof fish. Nat. Geographic 146: 718-727. Clark, E. 1974. Houdinis of the Red Sea. Internat. Wildlife 4(6): 13-17. Clark, E. 1975. The strangest sea. Nat. Geographic 148: 338-343. Clark, E. 1975. Acceptance of gold medal. Bull. Soc. Woman Geogr., 50th Anniversary Issue, Part 2: 76-78. Clark, E. 1975. Into the lairs of "sleeping" sharks. Nat. Geographic 147: 570-584. Clark, E. & H. Kabasawa. 1976. Factors affecting the respiration rates of two Japanese sharks, dochizame (Triakis scyllia) and nekozame (Heterodontus japonicus). Ann. Rep. Keikyu Aburatsubo Marine Park Aquarium 7-8: 14-26. (also published in Sci. Bull. Dept. Navy Off. Naval Research 1(1): 1-9. Kabasawa, H. & E. Clark. 1976. Respiration rates and activity patterns of the shark, dochizame (Triakis scyllia) in a large circular tank. Ann. Rep. Keikyu Aburatsubo Marine Park Aquarium 7-8: 27-38. Clark, E. 1976. Horrors of the deep. pp. 13-14. In: H.W. Menard (acad. coord.) Oceans, Our Continuing Frontier (Courses by Newspaper), Publisher's Inc., San Diego. Clark, E. 1976. Sharkproof! pp. 63-66. In: H.W. Menard & J.L. Scheiber (ed.) Oceans: Our Continuing Frontier, Publisher's Inc., Del Mar. Clark, E. 1977. Synagogues and sea fans. Israel's national parks and nature reserves. Nat. Parks Conserv. Mag. 51(4): 13-20. Clark, E. 1978. Foreword (pp. ix-xii) to book 'The man who rode sharks' by W.R. Royal with R.F. Burgess. Dodd, Mead & Company, New York. Clark, E. 1978. Sharks that ring bells. pp. 109-124. In: V. & R. Taylor & P. Goadby (ed.) Great Shark Stories, Harper & Row Publishers, New York. Clark, E. 1978. Flashlight fish of the Red Sea. Nat. Geographic 154: 718-728. Clark, E. & A. George. 1979. Toxic soles, Pardachirus marmoratus from the Red Sea and P. pavoninus from Japan, with notes on other species. Env. Biol. Fish. 4: 103-123. Clark, E. 1979. At the bottom of the sea. pp. 48-55. In: Z Sutherland (ed.) The Spirit of the Wind, Open Court, La Salle. Clark, E. 1979. Red Sea fishes of the family Tripterygiidae with descriptions of eight new species. Israel J. Zool. 28: 65-113. Clark, E. 1979. Marine life observed. pp. 57-64. In: D.W. Bennett (ed.) Fish Stories, Spec. Publ. 8, Amer. Littoral Soc., Sandy Hook. Clark, E. 1980. Distribution, mobility and behavior of the Red Sea garden eel. Nat. Geographic Soc. Res. Rep. 12: 91-102. Clark, E. 1980. Synagogues and sea fans -- Israel's national parks and nature reserves. pp. 143-149. In: Reading on the Protection and Management of Marine and Submerged Resources of the National Parks, Committee on Energy and Natural Resources, U.S. Senate, Publ. No. 96-113. Clark, E. 1981. Shark repellent effect of the Red Sea Moses sole, Pardachirus marmoratus. Abstracts of Papers 147th National Meeting AAAS, Toronto: 49. Clark, E. 1981. Shark repellent effect of the Red Sea Moses sole, Pardachirus marmoratus. Nat. Geographic Soc. Res. Rep. 13: 177-186. Clark, E. 1981. A Japanese shark repellent for the shark lady. pp. 82-84. In: B. Moore (ed.) Starting Points in Reading, Level D, Ginn and Company, Aylesbury. Clark, E. 1981. Sharks: magnificent and misunderstood. Nat. Geographic 160: 138-187. (reprinted in J.A. Quatrini. 1985. Speed reading. Arco Publishing, New York, pp. 172-180). Clark, E. 1982. Secrets of the Red Sea's. Sci. Digest 90(4): 46-53. Clark, E. 1983. Sand-diving behavior and territoriality of the Red Sea razorfish, Xyrichtys pentadactylus. Bull. Inst. Oceanogr. Fish. (Cairo) 9: 225-242. Vanderbilt, H.C. & E. Clark. 1983. A scientific and economic conceptual endeavor for the development of coastal marine parks and mariculture. Bull. Inst. Oceanogr. Fish. (Cairo) 9: 477-478. Clark, E. 1983. Shark repellent effect of the Red Sea sole. pp. 135-150. In: B.J. Zahuranec (ed.) Shark Repellents from the Sea, AAAS selected symposium 83, Westview Press, Boulder. Clark, E. 1983. Hidden life of an undersea desert. Nat. Geographic 164: 128-144. Clark, E. 1984. Japan's Izu Oceanic Park. Nat. Geographic 165: 462-491. Clark, E. 1985. Preface to book 'The Shark Watchers' Guide' by G. Dingerkus. Julian Messner, New York. Clark, E., P. Pemberton & R. Leen. 1985. Population density of a colony of bluespotted jawfish off Baja California. Underwater Naturalist 15(2): 3-7. Rabin, J.S. & E. Clark. 1986. Films in marine biology and related sciences. J. College Sci. Teaching 15(4): 264-266. Clark, E., E. Kristof & D. Lee. 1986. New eyes for the dark reveal the world of sharks at 2,000 feet. Nat. Geographic 170: 680-691. Clark, E. 1987. Fisheries and use of deep-sea sharks. pp. 221-225. In: S. Cook (ed.) Sharks, An Inquiry Into Biology, Behavior, Fisheries, and Use, Proc. Confer. NOAA, Oregon State University Extension Service, Portland. Clark, E. 1987. Foreword (p.11) to book 'Red Sea Fish Guide' by R. Deuvletian. Nubar Printing House, Cairo. Clark, E. 1987. Women scientific divers. pp. 134-143. In: W. Fife (ed.) Women in Diving, Proc. 35th Undersea and Hyperbaric Medical Soc. Workshop, Bethesda. Clark, E., J.S. Rabin & S. Holderman. 1988. Reproductive behavior and social organization in the sand tilefish, Malacanthus plumieri. Environ. Biol. Fish. 22: 273-286. Rabin, J.S., L.M. Benveniste & E. Clark. 1988. Flexibility of burrow-building by the sand tilefish, Malacanthus plumieri: an adaptation for survival in changing habitats. Proc. Abstr. 59th Ann. Meet. Eastern Psychol. Assoc. : 9. Clark, E. 1988. Down the Cayman wall. Nat. Geographic 174: 712-731. Clark, E., J.S.Rabin, E. Bunyan, Jr., I. Murdock, D. Shen & R. Petzold. 1989. Social behavior in the Caribbean tilefish. Underwater Naturalist 18(2): 20-23. Clark, E. & E. Kristof. 1990. Deep-sea elasmobranchs observed from submersibles off Bermuda, Grand Cayman, and Freeport, Bahamas. pp. 269-284. In: H.L. Pratt, Jr., S.H. Gruber & T. Taniuchi (ed.) Elasmobranchs as Living Resources, Advances in the Biology, Ecology, Systematics, and the Status of the Fisheries, NOAA Technical Report NMFS 90. Clark, E., J.F. Pohle & D.C. Shen. 1990. Ecology and population dynamics of garden eels at Ras Mohammed, Red Sea. Nat. Geographic Res. 6: 306-318. Clark, E. 1990. Preface (pp. ix-xiii) to 2nd edition of 'The Lady and the Sharks'. Mote Marine Laboratory, Sarasota. Clark, E. 1990. Dispatches from a distant world. Nat. Geographic 178(4): 12-19. Clark, E., M. Pohle & J. Rabin. 1991. Spotted sandperch dynamics. Nat. Geographic Res. Exploration 7: 138-155. Clark, E. & E. Kristof. 1991. How deep do sharks go? Reflections on deep sea sharks. pp. 79-84. In: S.H. Gruber (ed.) Discovering Sharks, Underwater Naturalist 19(4), 20(1), Spec. Publ. 14 Amer. Littoral Soc., Highlands. Clark, E. 1991. Preface to 'Watching Fishes' by R. Wilson & J.Q. Wilson. Harper & Row, New York. Clark, E. & J.F. Pohle. 1992. Monogamy in tilefish. Nat. Geographic Res. Exploration 8: 276-295. Clark, E. 1992. Gifted guidance to Egypt's wondrous reefs. Sea Frontiers 38(5): 20-27. Clark, E. 1992. Gentle monsters of the deep: whale sharks. Nat. Geographic 182(6): 120-139. Herold, D. & E. Clark. 1993. Monogamy, spawning and skin-shedding of the sea moth, Eurypegasus draconis (Pisces: Pegasidae). Environ. Biol. Fish. 37: 219-236. Randall, J.E. & E. Clark. 1993. Helcogramma vulcana, a new triplefin fish (Blennioidei: Tripterygiidae) from the Banda Sea, Indonesia. Revue fr. Aquariol. 20: 27-32. Clark, E. 1994. Forward (p. iii, iv), to book 'Fossil Sharks of the Chesapeake Bay Region.' Egan, Rees, and Bayer. Columbia, MD 146 pp. Nemtzov, S.C. & E. Clark. 1994. Intraspecific egg-predation by male razorfishes (Labridae) during broadcast spawning: filial cannibalism or intra-pair parisitism? Bull. Marine Sci. 55(1):133-141. Clark, E. 1994. Foreword (p. 5) to 'Whale Sharks: The Giants of Ningaloo Reef' by Geoff Taylor. Angus and Robertson, Sydney. Clark, E. 1994. Foreword to 'Red Sea Divers Guide II' by Shlomo Cohen. Sea Pen. Ramat Hasharon, Israel. Pierce, S.K., G.N. Smith, T.K. Maugel & E. Clark. 1995. On the giant octopus (Octopus giganteus) and the Bermuda Blob: homage to A.E. Verrill. Biol. Bull. 188:219-230. Cary, F.G. & E. Clark. 1995. Depth telemetry from the sixgill shark, Hexanchus griseus, at Bermuda. Environ. Biol. Fish. Clark, E. & J. Castro. 1995. 'Megamama' is a virgin: dissection of the first female specimen of Megachasma pelagios. (invited editorial) Environ. Biol. Fishes. 43:329-332. Cozzi, J. & E. Clark. 1995. Darting behavior of a sandburrower fish, Limnichthys nitidus (Creediiae), in the Red Sea. Environ. Biol. Fishes. 44:327-336. Clark, E. & M. Pohle. 1996. Trichonotus halstead, a new sand-diving fish from Papua New Guinea. Environ. Biol. Fishes. 45:1-11. Clark, E. 1996. Fish imagery in art 81: fish on a front door. Environ. Biol. Fishes. 45:12. Joung, S.-J., C.-T. Chen, E. Clark, S. Uchida & W.Y.P. Huang. 1996. The whale shark Rhincodon typus is a livebearer: 300 embryos found in one "megamama" supreme. Environ. Biol. Fishes. 46:219-223. Clark, E. 1996. Introduction. pp. 8-9. In: D. Matthews, Sharks! The Mysterious Killers. Discovery Channel Books, Park Lane Press, Avenel, NJ. Castro, J., E. Clark, K. Yano and K. Nakaya. 1997. The gross anatomy of the female reproductive tract and associated organs of the Fukuoka megamouth shark (Megachasma pelagios). pp. 115-119. In: K. Yano, J.F. Morrissey, Y. Yabumoto, & K. Nakaya (ed.) Biology of the Megamouth Shark. Tokai University Press, Tokyo, Japan. Clark, E. & D. Nelson. 1997. Young whale sharks, Rhincodon typus, feeding on a copepod bloom near La Paz, Mexico. Environ. Biol. Fishes. 50(1):63-73. Clark, E., J. Pohle & B. Halstead. 1998. Ecology and behavior of tilefishes, Hoplolatilus starcki, H. fronticinctus and related species (Malacanthidae): non-mound and mound builders. Environ. Biol. Fishes. 52(4):395-417. Clark E. & R. Petzold. 1998. Spawning behavior of the collared knifefish, Cymolutes torquatus (Labridae) in Papua New Guinea. Environ. Biol. Fishes. 53(2):459-464. 1978 McGovern, Ann. Shark Lady, True Adventures of Eugenie Clark, Scholastic, Inc., New York. (paperback) ISBN 0-590-44771-8. 1979 McGovern, Ann. Shark Lady, True Adventures of Eugenie Clark, Four Winds Press, New York. (hardback) ISBN 0-02-767060-0. 1998 McGovern, Ann. Adventures of the Shark Lady: Eugenie Clark Around the World, Scholastic, Inc., New York. (paperback) ISBN 0-590-45712-8. The Shark Lady and the Convict Fish. Mote Magazine (fall 2003), 14-15. 1988 Home Room building, Pine View Elementary School, Sarasota, FL. 1990 Honorary Citizen and Key to the City of Sarasota, FL. 1986 Carried flag of the Explorers Club on the "First American Diving Expedition to South China"